So, I highly recommend spending one Sunday afternoon making a big batch of these tasty treats. It will take some time and oh it will make a mess, but I promise it is definitely worth it. Plus, if you have kids I am sure they would LOVE to help you roll out the dough. You don’t even have to tell them that the yummy, sweet butternut squash inside the ravioli is actually a vegetable! This dish is comprised of three recipes. 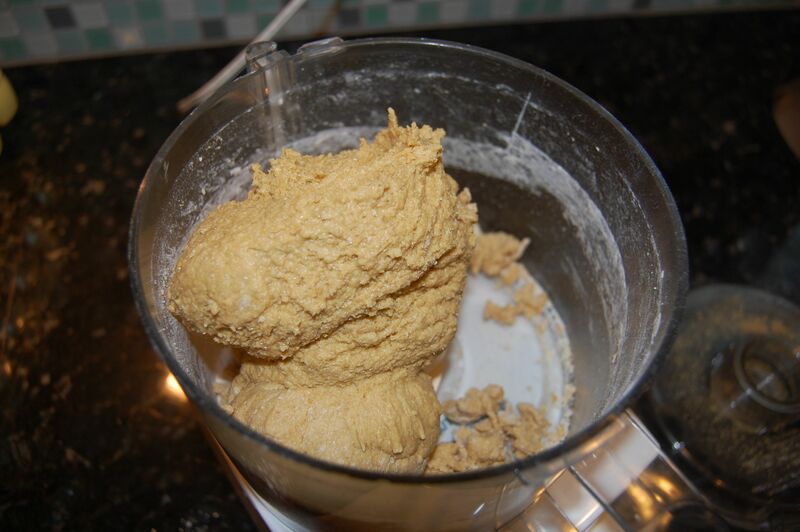 Blend the eggs and flour together in a food processor (with dough blade), kitchen aid mixer (with dough hook), or by hand with a fork. If using a processor or mixer the dough will be one large ball chasing itself around the bowl when it is done. 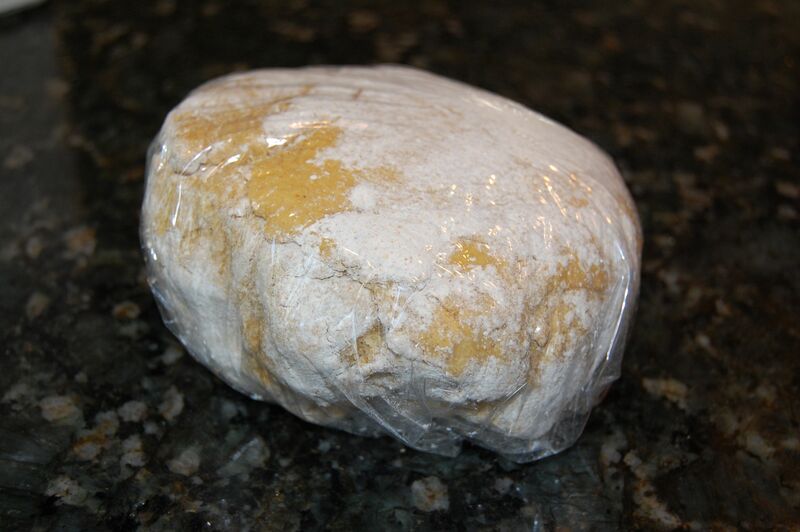 If the ball of dough is even slightly sticky when you take it out then pat it with flour. Wrap it in plastic wrap and let it rest for at least 20 – 30 minutes on the counter. Either roll it out by hand or use a pasta machine to thin out the dough and make sheets of pasta (follow manufacturers instructions). When you are working with your dough it should not be sticky at all so pat it with flour as needed. My pasta machine has 6 settings – setting 1 makes the dough the thickest and 6 makes it the thinnest. I start on 1, fold the dough over a few times and keep running it through on setting 1 until it is a nice flat piece. Then you progress through 2, 3, 4, etc. to the desired thickness. I find that when making ravioli it is best to stop at 4 otherwise it will get too thin and break apart easily once the moisture of the filling touches it. Preheat oven to 400 degrees F. Slice the squash lengthwise and remove the seeds. Put the cut side down on a greased baking sheet (or sheet covered with parchment paper). When squash is done scoop the pulp out into a large mixing bowl and discard the skin. Add all ingredients from the butter down to the salt and pepper and stir together thoroughly. This filling can be made a day in advance or used to make raviolis immediately. 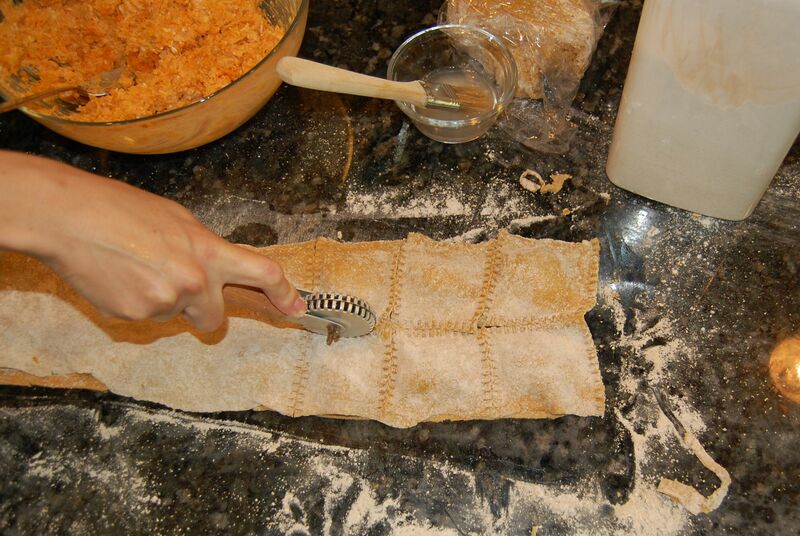 When you are ready to make the raviolis, follow the instructions above for making your dough. 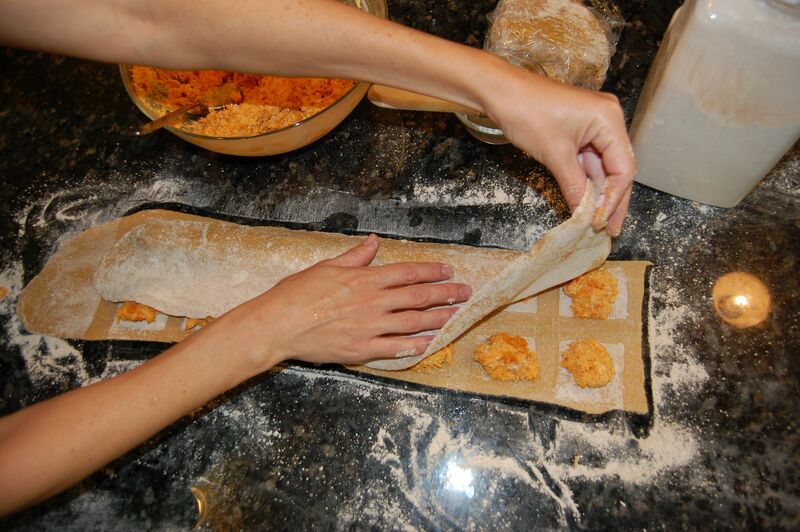 Lay the finished dough out in sheets and by the spoonful add the ravioli filling. You can brush the dough in-between the filling with either warm water or some egg wash (egg with a touch of water) to help the two pieces stick together. I use an inexpensive Williams Sonoma ravioli tool to seal it together. Freeze (do not refrigerate) leftovers on sheets of wax paper in a Tupperwear container. Raviolis should not be touching and there is never a need to defrost…just throw the frozen ones right in the boiling water for about 4 minutes. If you are boiling them fresh just after making them then it only takes about 3 minutes. Cook the butter over med-high heat in a sautee pan. Add the sage leaves to the butter. 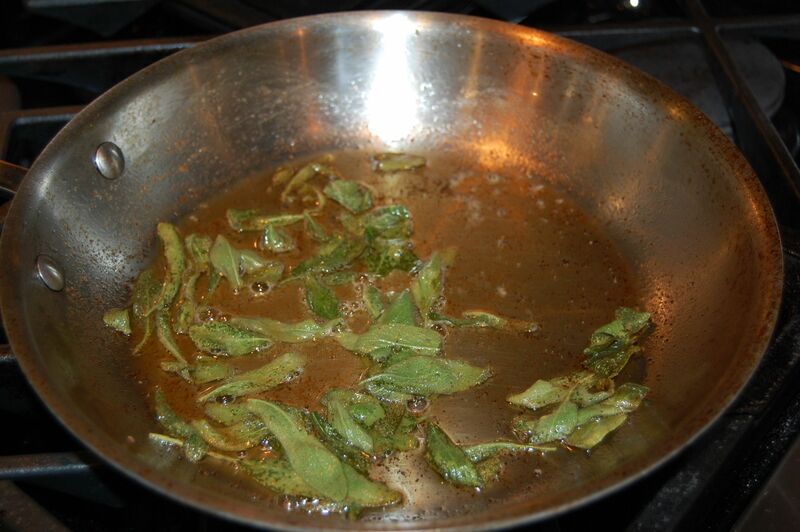 Cook until butter begins to turn brown then remove from heat immediately. This looks amazing! I so desperately want to start making meals from scratch. Maybe I will try this as my first attempt! 🙂 I can just see myself making a huge mess though! 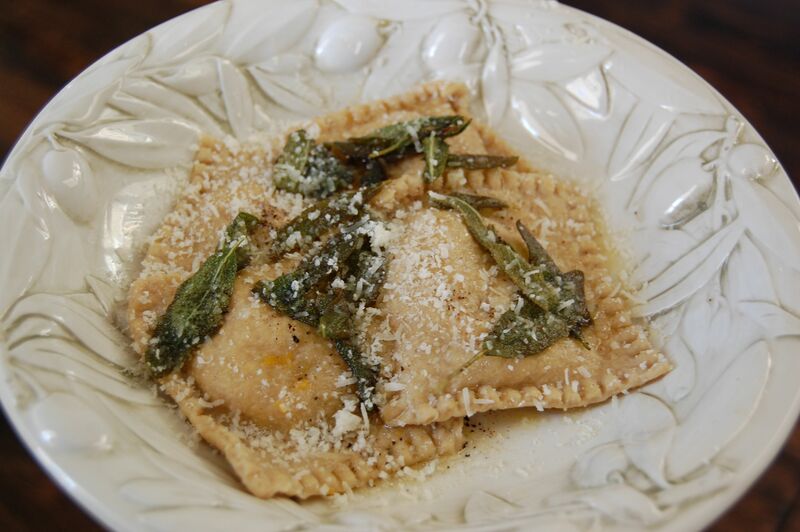 Did it take several tries for you to get the ravioli’s as perfect as they are above? I have been making pasta for about 10 years so I am not sure if I remember how they turned out the first few times! But with anything ….lots of practice does help. You have to start somewhere though so definitely give it a shot (and don’t let your dough get too sticky while you are doing it). Good luck! I’ll be trying this recipe. I’ve done ravioli before and have a pasta machine and the ravioli making thing you picture. I’ve been wanting to do a squash recipe. I’ve been enjoying keeping up with your journey. All you need to add to your “homemade”ness, is grinding your own grain. I’ve been doing that now for years. It truly is the best nutritive choice – fresh ground flours! I will definitely try this recipe, I have seen butternut squash at our farmers market already and my kids typically like it. Question for Karey who posted earlier… Can you tell me more about grinding your own grain? Where do you get the grain, tools needed, etc.?? I have been wanting to try. 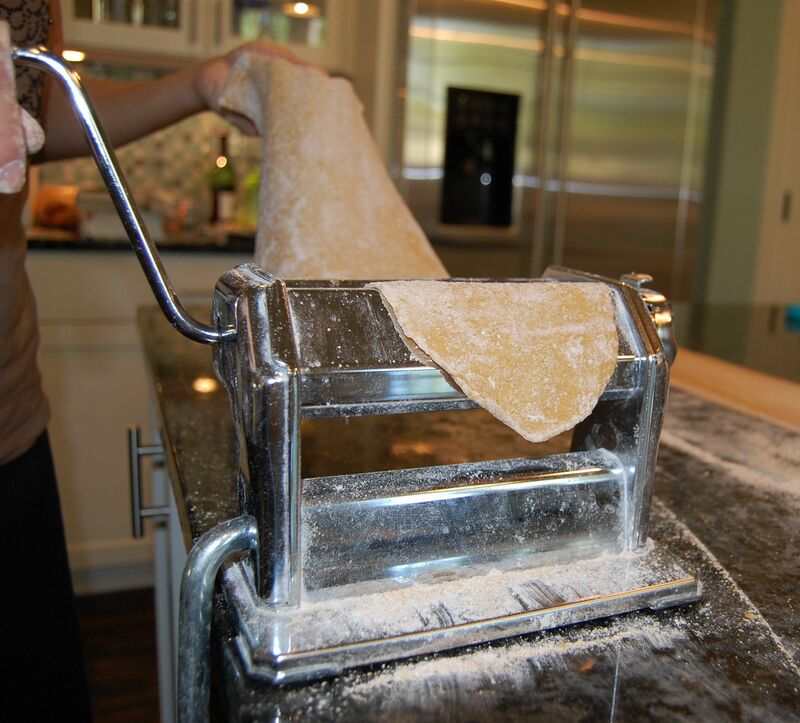 All this talk about pasta dough has me thinking…. I have been making my grandmother’s pie dough from scratch and freezing it for several years now. It is so much better than store bought. But, we use white flour in ours. Have you tried it and if so, have you or anyone else tried it with whole wheat flour? I would love to be able to use the King Arthur’s white whole wheat! I have not tried pie dough with whole-wheat yet, but you should definitely give it a shot! I have also seen whole-wheat “pastry” flour for sale in the bulk bins at Earthfare so if the white whole-wheat flour doesn’t work you might want to try that. I make pie crust from whole grain flour I’ve ground, and butter … whatever grain I’ve got ground in the freezer in ziplock, including whole wheat, kamut, or spelt. Anyway, I’ve been seeing butternut squash at the Farmers Market… sounds like I’m going to be making some pasta!! 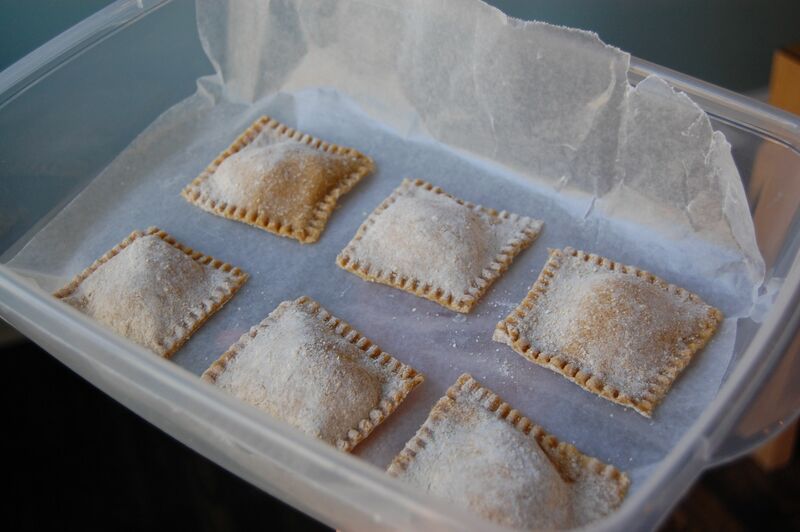 Question… once the ravioli are frozen can they touch each other? If you are thinking of freezing them while they are separated and then throwing them all in a zip lock back together…I think that should work although I have not tried it yet myself. And once you have a little practice making pasta it will become so much easier. You will be very pleased with the results – it is SOO much better than the dried store-bought stuff! I can’t wait to try this! My husband and I spent 2.5 weeks in Italy this summer and I have to say the food was amazing and so fresh. Dried pasta doesn’t even compare to fresh pasta. We actually bought a ravioli stamp to bring back with us, with plans to purchase a pasta attachment for our Kitchenaid, so we could make fresh pasta for ourselves at home. We had such delicious ravioli, including some butternut squash ravioli, so I am looking forward to breaking out our ravioli stamp to try out this recipe! Lucky you spending time in Italy! I couldn’t agree with you more about the difference between fresh and dried pasta. Good luck with your new cooking tools! I’m making these right now! I have 2 smallish butternut squashes and I have no idea how much they weigh. Do you know how many cups of squash 2 1/2 lbs would yield? I’m going to try to double the recipe with what I have so we’ll see how it turns out! With two small ones I would do about 1.5 recipes…not quite 2!